CAPE CANAVERAL AIR FORCE STATION, FL — The pancaked leftovers of a SpaceX Falcon 9 first stage from last week’s successful commercial launch but hard landing at sea, pulled silently and without fanfare into its home port over the weekend – thereby ending a string of three straight spectacular and upright soft ocean landings over the past two months. The residue of the Falcon sailed into home port at Port Canaveral, Fl under cover of darkness and covered by a big blue tarp late Saturday night, June 18, at around 9 p.m. EDT. 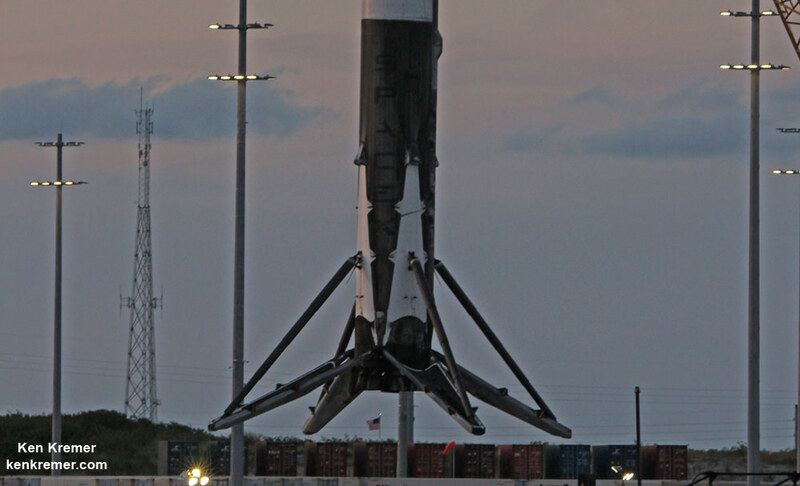 It arrived atop SpaceX’s ASDS drone ship landing platform known as “Of Course I Still Love You” or “OCISLY” – that had already been dispatched several days prior to the June 15 morning launch from the Florida space coast. And check out this exquisite hi res aerial video of the tarp ‘Blowing in the Wind’ – showing an even more revealing view of the remains of the Falcon 9 after much of the tarp was blown away by whipping sunshine state winds. 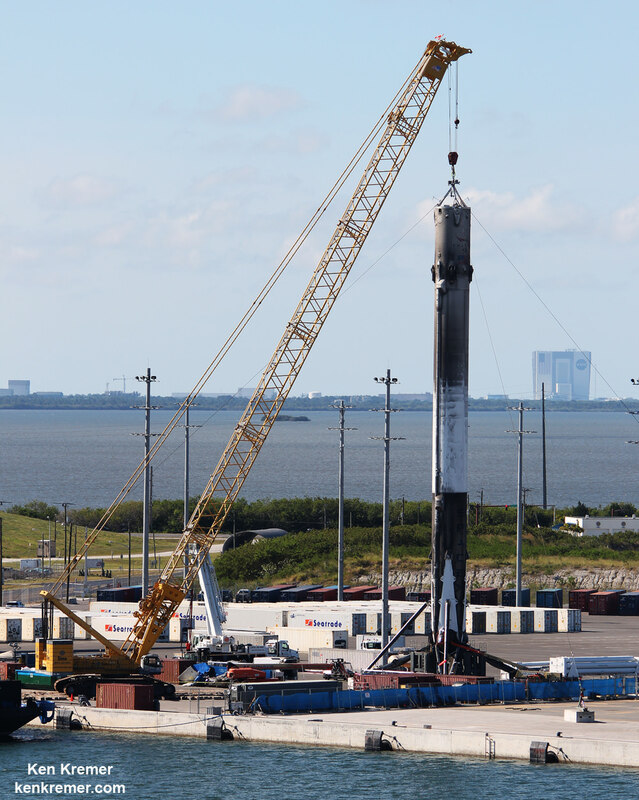 Recovering and eventually reusing the 156 foot tall Falcon 9 first stage to loft new payloads for new paying customers lies at the heart of the visionary SpaceX CEO Elon Musk’s strategy of radically slashing future launch costs and enabling a space faring civilization. 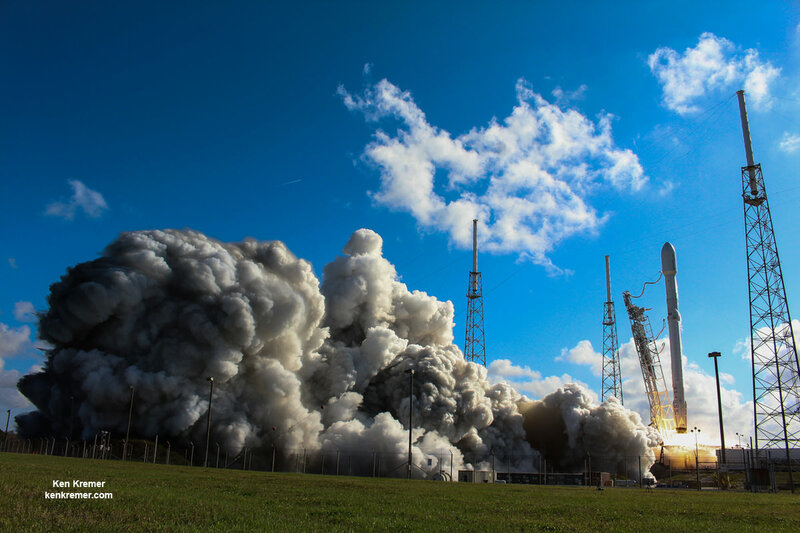 The latest attempt to launch and propulsively land the Falcon booster on a platform a sea took place on Wednesday, June 15 after the on time liftoff at 10:29 a.m. EDT (2:29 UTC) from Space Launch Complex 40 on Cape Canaveral Air Force Station in Florida. The 229 foot-tall (70 meter) Falcon 9 successfully accomplished its primary goal of delivering a pair of roughly 5000 pound commercial telecommunications satellites to a Geostationary Transfer Orbit (GTO) for Eutelsat based in Paris and Asia Broadcast Satellite of Bermuda and Hong Kong. 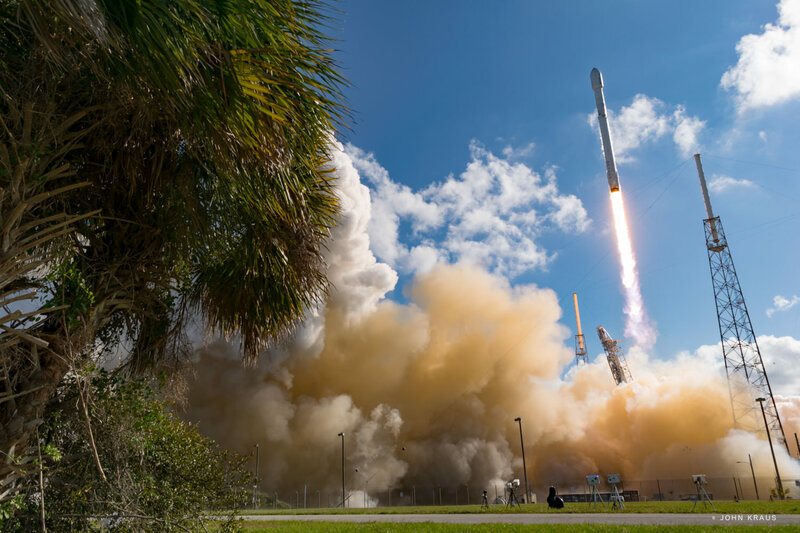 The Falcon 9 delivered the Boeing-built EUTELSAT 117 West B and ABS-2A telecommunications satellites to orbits for Latin American and Asian customers. After first stage separation, SpaceX engineers attempted the secondary and experimental goal of soft landing the 15 story tall first stage booster nine minutes after liftoff, on an ocean going ‘droneship’ platform for later reuse. OCISLY was stationed approximately 420 miles (680 kilometers) off shore and east of Cape Canaveral, Florida in the Atlantic Ocean. However, for the first time in four tries SpaceX was not successful in safely landing and recovering the booster intact and upright. The booster basically crashed on the drone ship because it descended too quickly due to insufficient thrust from the descent engines. The rocket apparently ran out of fuel in the final moments before droneship touchdown. “Looks like early liquid oxygen depletion caused engine shutdown just above the deck,” Musk explained via a twitter post. The first stage is fueled by liquid oxygen and RP-1 propellant. A SpaceX video shows a huge cloud of black smoke enveloping the booster in the final moments before the planned touchdown – perhaps soot from the burning RP-1 propellant. In the final moments the booster is seen tipping over and crashing with unrestrained force onto the droneship deck – crushing and flattening the boosters long round core and probably the nine Merlin 1D first stage engines as well. “But booster rocket had a RUD on droneship,” Musk noted. RUD stands for rapid unscheduled disassembly which usually means it was destroyed on impact. Although in this case it may be more a case of being crushed by the fall instead of a fuel related explosion. The June 15 crash follows three straight landing successes at sea – on April 8, May 6 and mostly recently on May 27 after the Thaicom-8 launch. See my onsite coverage here of the Thaicom-8 boosters return to Port Canaveral on the OCISLY droneship. Yet this outcome was also not unexpected due to the high energy of the rocket required to deliver the primary payload to the GTO orbit. “As mentioned at the beginning of the year, I’m expecting ~70% success rate on landings for the year,” Musk explains. And keep in mind that the rocket recovery and recycling effort is truly a science experiment on a grand scale financed by SpaceX – and its aiming for huge dividends down the road. PORT CANAVERAL, FL – As you may have heard its Mars opposition season. What you may not have heard is that Mars made its closest Earth approach high in the Sunshine states nighttime skies coincidentally at the same time as a sea landed SpaceX Falcon 9 was visible just offshore floating on the horizon below. Rather miraculously this regular natural occurrence of the dance of the planets Earth and Mars making a close embrace as they orbit around our Sun, was taking place simultaneously with a most unnatural event – namely the return of a used SpaceX Falcon 9 landed on a platform at sea that was briefly hugging the Florida coastline. And better yet you can see them celebrating this first-of-its-kind celestial event together in the photo above of ‘Mars Close Approach over Falcon’ – captured by this author around 11 p.m. EDT on Wednesday, June 1 from the rock wall along Jetty Park Pier in Port Canaveral, Fl. By sheer coincidence, the Red Planet was making its closest approach to Earth of this orbital cycle just as the most recently launched and recovered SpaceX Falcon 9 first stage booster was arriving just offshore of Cocoa Beach and the Florida Space Coast earlier this week. As luck would have it, when I ventured out to watch the boosters hoped for nighttime arrival from Jetty Park Pier in Port Canaveral on Wednesday, June 1, I noticed that Mars and the floating Falcon 9 were lined up almost perfectly. Mars is visible at the head of the large constellation Scorpius. The Falcon 9 was standing atop the droneship upon which it had landed on May 27 while it was stationed approximately 420 miles (680 kilometers) off shore and east of Cape Canaveral, Florida, surrounded by the vastness of the Atlantic Ocean. 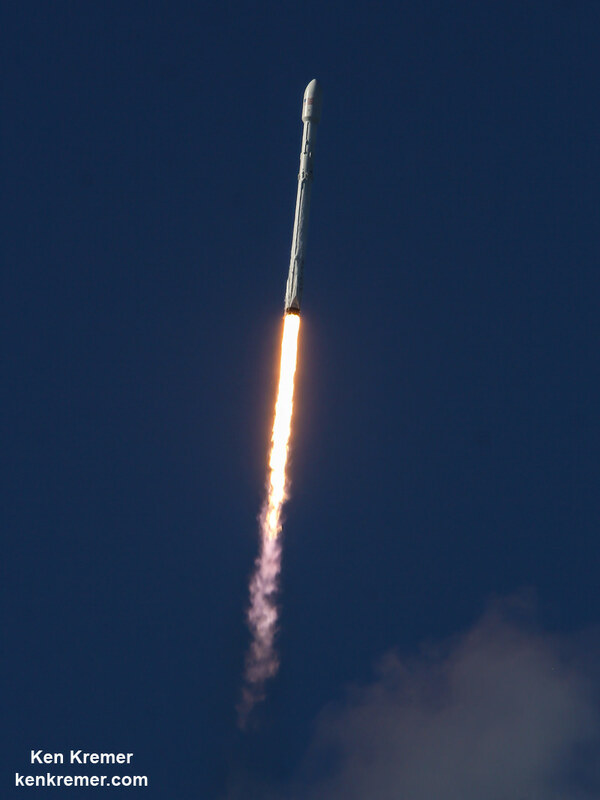 The Falcon 9 was carrying the Thaicom-8 telecommunications satellite to orbit. On Wednesday night, June 1, Mars was high in the southern night sky, shining brightly almost directly over the spent Falcon 9 booster sailing some 3 miles (5 km) offshore of Cocoa Beach. Thankfully the weather gods even cooperated by delivering crystal clear nighttime skies. So with Mars at Opposition and Falcon 9 in view and while awaiting the droneship bringing the booster into Port Canaveral I took some exposure shots of this first totally unique opportunity. Mars Close Approach took place on May 30, 2016. That is the point in Mars’ orbit when it comes closest to Earth. The Red Planet was only 46.8 million miles (75.3 million kilometers) from Earth. “Mars reaches its highest point around midnight — about 35 degrees above the southern horizon, or one third of the distance between the horizon and overhead,” according to a NASA description and the graphic shown below. Mars is currently visible for much of the night. Mars oppositions happen about every 26 months when Mars and the sun are on directly opposite sides of Earth. The 156 foot tall Falcon 9 booster had landed atop the specially designed SpaceX ‘droneship’ named “Of Course I Still Love You” or “OCISLY” less than 9 minutes after the May 27 blastoff. 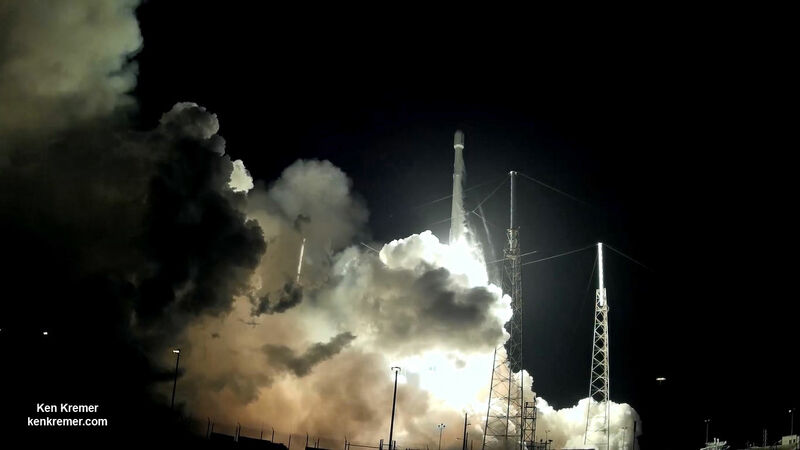 The Thaicom-8 mission marked the third time SpaceX nailed a booster landing on an ocean going platform. But unlike the prior two sea landings, this booster came to rest at noticeable tilt. This caused SpaceX some headaches and concern it might fall over and be destroyed in transit before reaching land. 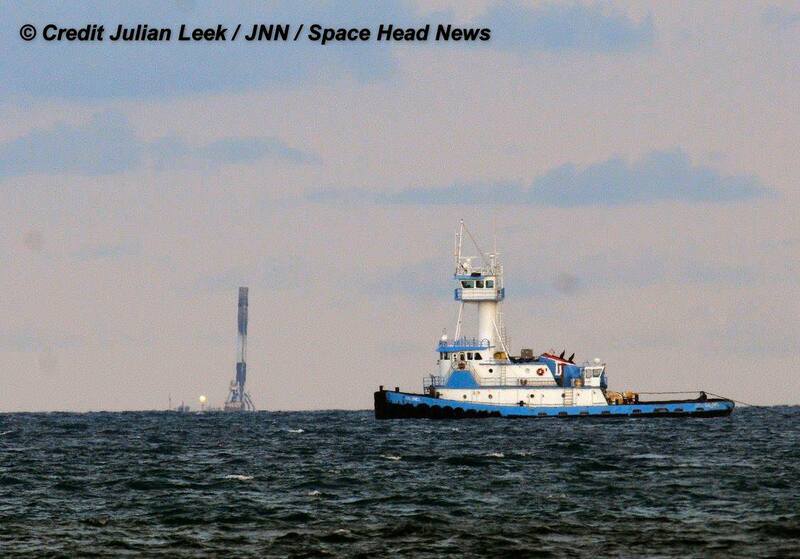 So the booster didn’t make it back into port Wednesday night as onlookers had hoped. And SpaceX did not announce a return schedule. It actually would up station keeping and hugging the shoreline for nearly 2 extra days while workers stabilized the booster. The 15 story tall spent first stage was secured with multiple tie downs to the droneships deck. As I witnessed and reported here, the booster finally sailed triumphantly into the mouth of Port Canaveral around lunchtime on Thursday, June 2. Mars and the recovered Falcon 9 actually tie in rather neatly. The SpaceX rockets launch and recovery technology are all being developed so they will one day lead to establishing a ‘City on Mars’ – according to the SpaceX’s visionary CEO and founder Elon Musk. And this author is also a well known Mars lover. CAPE CANAVERAL AIR FORCE STATION, Fla. – Just three weeks after SpaceX’s last launch from their Florida launch base, the growing and influential aerospace firm is deep into commencing their next space spectacular – targeting this Thursday, May 26, for launch of a Thai comsat followed moments later by a sea landing attempt of the booster on a tough trajectory. SpaceX is slated to launch the Thaicom-8 telecommunications satellite atop an upgraded version of the SpaceX Falcon 9 on Thursday at 5:40 p.m. EDT from Space Launch Complex-40 at Cape Canaveral Air Force Station in Florida. SpaceX is rapidly picking up the pace of rocket launches for their wide ranging base of commercial, government and military customers that is continuously expanding and reaping contracts and profits for the Hawthorne, Calif. based company. This commercial mission involves lofting Thaicom-8 to a Geostationary Transfer Orbit (GTO) for Thaicom PLC, a leading satellite operator in Asia. This also counts as the second straight GTO launch and the second straight attempt to land a rocket on a sea based platform from the highly demanding GTO launch trajectory. Will this mission make for 3 successful Falcon 9 1st stage booster landings in a row? Tune in and find out !! Engineers have a two-hour window to launch the Falcon 9 and deliver Thaicom to orbit. The two stage Falcon 9 rocket has a two-hour launch window that extends until Thursday, May 26 at 7:40 p.m. EDT. The path to liftoff was cleared late last night the company completed the customary pre-launch static fire test of the rocket’s first stage upgraded Merlin 1D engines for several seconds at pad 40. The nine engines on the 229 foot tall Falcon 9 rocket generate approximately 1.5 million pounds of thrust. Engineers monitored the test and after analyzing results declared the Falcon 9 was fit to launch Thursday afternoon. The weather currently looks very good. Air Force meteorologists are predicting a 90 percent chance of favorable weather conditions at launch time Thursday morning with a minor concern for ground winds. The backup launch opportunity is Friday, May 27. The weather outlooks is somewhat less promising at a 70 percent chance of favorable conditions. After the Falcon 9 rocket delivers the satellite into its targeted geosynchronous transfer orbit it will enter a 30-day testing phase, says Orbital ATK. Following in-orbit activation and after reaching its final orbital slot, Orbital ATK will then turn over control of the satellite to Thaicom to begin normal operations. THAICOM 8’s orbital location will be positioned at 78.5 degrees east longitude and the satellite is designed to operate for more than 15 years. Thaicom-8 is a Ku-band satellite that offers 24 active transponders that will deliver broadcast and data services to customers in Thailand, Southeast Asia, India and Africa. Thaicom-8 has a mass of approximately 6,800 pounds (3,100 kilograms). It is based on Orbital ATK’s flight-proven GEOStar-2TM platform. “We built and delivered this high-quality communications satellite for Thaicom PLC two months ahead of schedule, demonstrating our ability to manufacture reliable, affordable and innovative products that exceed expectations for our customer,” said Amer Khouri, Vice President of the Commercial Satellite Business at Orbital ATK. Thaicom-8 will join Thaicom-6 already in orbit. It was also designed, manufactured, integrated and tested by Orbital ATK. at the firm’s state-of-the-art satellite manufacturing facility in Dulles, Virginia. 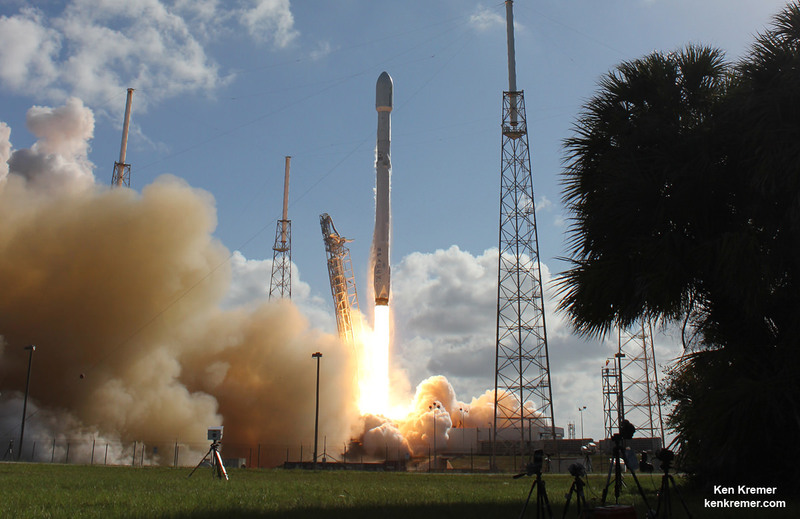 Thaicom PLC commissioned Thaicom-8 in 2014, shortly after SpaceX launched the THAICOM 6 satellite into orbit in January 2014. The secondary test objective of SpaceX is to land the Falcon 9 rockets first stage on an ocean going barge several hundred miles offshore in the Atlantic Ocean. However with this mission’s GTO destination, the first stage will be subject to extreme velocities and re-entry heating and a successful landing will be difficult. Having said that and despite those hurdles, the last GTO mission landing attempt did succeed brilliantly following the May 6 JCSAT-14 launch. Tune in to the SpaceX webcast Thursday afternoon to catch all the exciting action !! 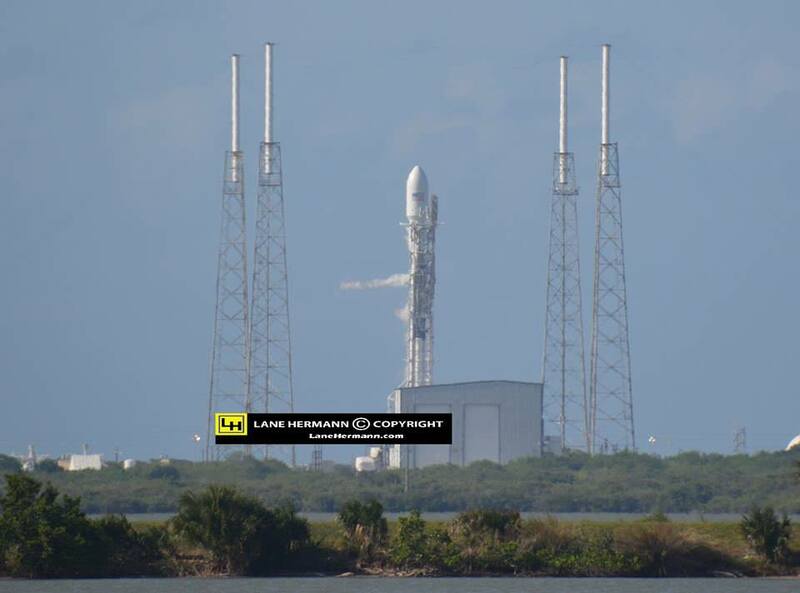 Watch for Ken’s on site reports direct from Cape Canaveral and the SpaceX launch pad.